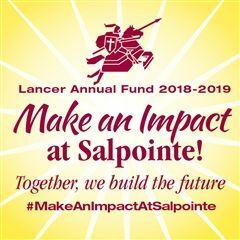 Salpointe was proud to induct this year's Boys and Girls Soccer teams into the Sports Hall of Fame after both won State Championships this season. A ceremony celebrating the two clubs was held on Thursday, March 7, 2019. Salpointe President Kay Sullivan and Athletic Director Phil Gruensfelder commended both teams for their hard work throughout the year. This was the 7th State Championship for both programs. It was the third consecutive State Championship for the Girls, while it was the first for the Boys since 2013. "It was a true team effort this year," said Boys Coach Wolfgang Weber, who has been at Salpointe since 1982-83. "Everyone contributed on this team. In some years we've had one or two players who carry us, but not this year. I was proud of how they came together during the season and had a strong run right until the very end." All teams at Salpointe who win State are inducted into the Hall of Fame. If you would like to nominate someone for the Hall of Fame, please click here.